Gjelina is a restaurant on trendy Abbot Kinney Blvd in Venice, which is very popular despite of its unpronounceable name (it’s ja-lee-na). It is a kind of place that embodies everything great about LA when we get it right; The setting relaxed and casual but sophisticated and stylish, food simple at a glance but masterfully crafted and balanced with well selected ingredients, and wait staff good looking and friendly but not too friendly. You get the idea. The problem is that EVERYBODY thinks the place is great (including Robert Downey Jr., who apparently makes frequent appearances… at least according to Yelp, although I have never seen him there) so the table is rather hard to book. But when I want to go there, I must go there and have their decadent maitake mushroom toast with truffle oil, super thin-crust pizza with Gruyere and arugula, and most of all, the unforgettable chickpea stew – NOW. Not tomorrow, not the day after. And definitely not in 2 weeks. Out of my typical impatience and desperation, I had no choice but to attempt recreating my favorite dish so I can still function as a socially productive human being while I wait for my reservation. My version is probably much simpler and quick to make – creamy chickpeas are simmered in rich, cumin-infused tomato sauce along with silky spinach, then topped with yogurt and harissa – but passed my own test to be good enough to get me through those sudden urges. Crisis averted! I just need to make sure I will never be without chickpea and harissa in my pantry, pretty much for the rest of my life. The stew was served at the restaurant with Israeli couscous, but I like mine with steamed bulgur wheat. I usually soak chickpeas overnight and use them so they are crunchier (NOTE: I put water and chickpea in a medium sauce pan, cover and bring to boil once then turn off heat and leave it covered overnight), but canned chickpeas work fine as well in a pinch, or could be better if you like softer texture. With this rendition having become one of my weeknight stand-by’s, I haven’t been back to Gjelina for a while. As a matter of fact, I haven’t been there for so long that I checked their homepage prior to publishing this post to find out the chickpea stew is no longer on the menu. But now I’m debating with myself as to whether I should go back there and try out “new” items or not, as it will surely start another wave of my dangerous obsession. I don’t think I can resist… And to think that I just might finally run into Mr. Downey Jr. next time doesn’t help, either. Heat olive oil in a large skillet or shallow braising pan over medium heat. Add onion and cook, stirring often, until it becomes translucent for about 4-5 minutes. Add garlic and cumin and continue to cook to blend flavors, about 2 minutes. Add tomato paste and cook. Stir well to distribute the paste, about 1-2 minutes. Add chickpea and soup stock, salt and pepper to here. Bring the mixture to boil over high heat, then cover and lower the heat to lively simmer for 15 to 20 minutes, until soup is reduced to a half to a third, depending on how soupy you like your stew to be. Add spinach and cover until it is wilted and cooked down, about 3-5 minutes. Remove from the heat and stir to mix spinach well. Serve with a generous dollop of Greek yogurt, topped with harissa and cilantro. This entry was posted in Beans and Legumes, Entree, Vegetables and Fruits and tagged chickpeas, Gjelina, spinach, stew on January 23, 2013 by snowcone. I and my boyfriend are not really vegetarian, but try to eat more beans than meat to keep up better health. Cooking without meat is somewhat challenging, especially if you want to make dish which is filling and tasty with full flavor. Also usually vegetable dish leaves me the feeling of “hmm… I ate dinner, but I need to eat something more”. 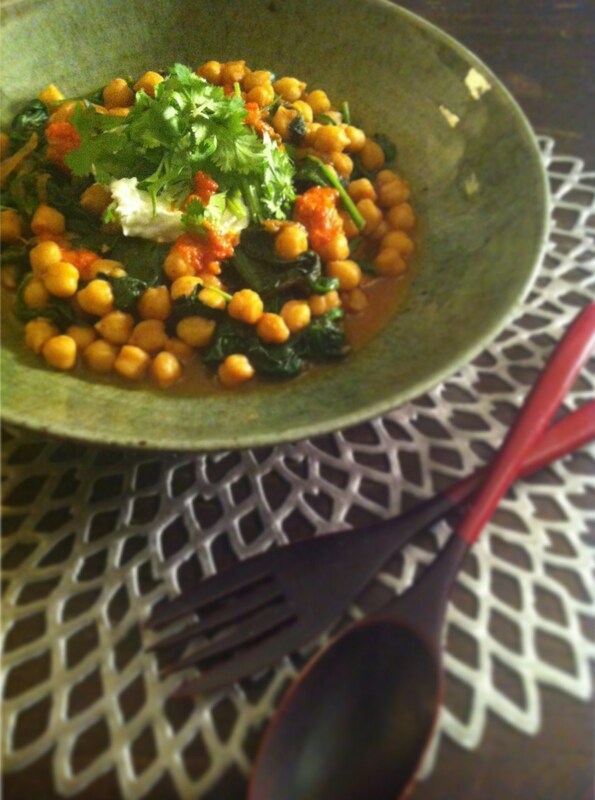 However “Chickpea and Spinach Stew“ brings me satisfaction for both tasty food and filling my hungry stomach. – and I simply feel good to eat this healthy dish without worrying about excessive fat consumption. My boyfriend loves meat and he has been eating meat whole his life. And he said, “It’s very filling and tasty, I can eat this every day.” — This is how much he loves this dish. It’s very easy and quick to cook, yet very tasty dish and I recommend everyone to try this dish. This is delicious! Just missing the israeli couscous and then I think you’ve nailed it!